Interior designing is one of my personal favorite professions, and I find it to be a very exciting business opportunity. In fact, those who have natural affinity to style, fashion, glamour, painting, creativity etc and possess great imaginative skills, for them interior designing is a wise and apt choice of profession. With initiative from Government of India, housing sector is expected to grow rapidly and that is going to create a lot of opportunity for interior designing companies in India. Interior designing as a business offers huge opportunity for growth and hence if you want to start interior designing business in India, then probably this is the right time to get started. But if you are clueless about how and where to start then here’s the post checking. Today’s youth are exploring various innovative business ideas and interior designing business for sure offers plenty of scope for them to experiment and establish themselves. Youth of this generation are attracted to creative profession more than usual mainstream jobs. Interior designing is also a flourishing industry here in India and you can surely take it as a career and start your own company. What happens most of the time is even though you have the required skills and the determination; you do not know where to start and how to start interior design business. In fact, until and unless you belong from a family where many of your family members are in business, it is hard for common men and women to complete the basic regulatory documentation and setup a new business. Even though the process of registering a business is not as complicated today, not knowing where to start and how to get it right is very common. What are the various types of options for company formation? How to setup a team for interior business? How to get your first and subsequent clients? How to market and scale your business? I have seen many of my known pals who are talented but gave up their dreams of going in to a field that they were passionate about. This is wrong, because, one should choose a carrier that he or she is truly passionate about. For instance if you are creative and you wanted to become an interior designer, then you should not force yourself in to another profession. Magic happens, when you choose a career that you are truly passionate about. You should use your potential into something you are good at, instead of choosing some other profession just for the sake of living or social pressure. In ancient India, parents often forced their child to become a doctor or an engineer etc. as if they cannot earn a living choosing other profession. But, now times are changing and there are families who allow their children chase their dream. So, if you also have the will power to become a successful interior designer and start your own interior designing business, then all you need is a little clarity and guidance to start interior designing business and work passionately to grow it. Interior designing is a great profession as you get to work with different types of client and always have the opportunity to reinvent the design and concept as per client’s requirements. With raising flat culture, people want to design their space to utilize the available space correctly and make it comfortable for living. Obviously they need to take the help of professional interior designers to design and decorate their properties like home, office, shop and other commercial establishments. Bespoke interior designing is already popular and in high demand in major cities like Mumbai, Pune, Bangalore, Hyderabad, Kolkata, Delhi, Gurgaon etc. but, the concept of interior designing is slowly spreading in other tier II cities in India like Ahmedabad, Baroda, Kochi, Patna etc. The field of interior designing is large and contains several sub sectors like basic and advanced carpentry, fabrication, antique furniture refurnishing, flooring, furnishing, basement remodeling, plumbing, electrical, ceiling etc. So, the first step that you have to take is to identify who your clients are and that is directly related to the kind of people you need in your team. So, if you want to start interior design business in India, then here are a few of the most essential things worth knowing. It all starts with identifying the targeted client base you want to serve. There are people who have no issues with the budget, want exceptionally stunning design and best quality finish. But there are usual customers as well, who want to get the interior designing and execution done within certain budget. To them, the quality is obviously important, but they are equally concerned about the budget and they would not want to go beyond certain budget. 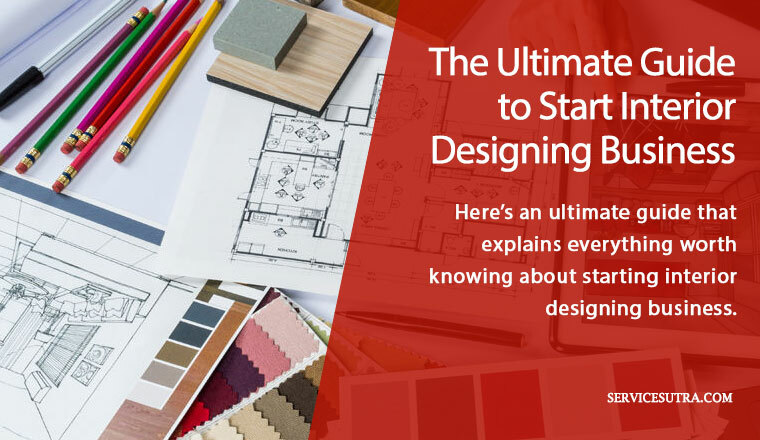 To be successful in the interior designing business, you have to have a clear understanding of which types of customers you want to work with. You may like to work only with the premium customers or the usual ones, based on your expertise, capabilities and availability of resources. There may be advantage and disadvantage of serving only specific customers with specific budget. But then, that’s how you create a name and distinguish yourself. You can’t be serving one and all, and so you have to be very specific about your targeted customer base. Once you know, whom you want to serve, you should start researching about them. Start by finding the basic information about your potential clients, what they like, what they don’t like, where do they hang, how to reach them and so on. You also need to have ample information regarding the size of the market, the essential services, and the specific products that are in demand at the present moment and so on. Lastly, you should be well acquainted with what the clients generally expect from you. If you got this clarity, starting and growing your interior design business will be much easier. But if you start targeting randomly picked customers and instead of serving niche client, if you start taking on each and every assignment coming your way, you will end up in a mess. So the very first thing before you start interior designing business is to identify your targeted client base and know as much as you can about them. Irrespective of the type of business you want to start, you have to invest initially and interior design business is no different. Thankfully, you do not need to invest too much of money to begin with because it’s a consulting business and you can start with very minimal investment. You only need to bear some operational costs, rent out an office and purchase basic office accessories, which is required to make an office operational like computer, printer, desk, chair, branding etc. Avoid overspending in accessorizing the office, because you need the funds to keep your office operational for initial few months, unless the funds start rolling. Make sure to keep surplus money to continue your work in the next 6 or 9 months without any problems. This is because, initially, it may be difficult to find new clients but slowly that will get sorted once you get into the flow. So think of finances carefully and have a detailed monthly and operational cost in mind. Once you are done with the type of interior business you want to start, and have decided about who your targeted clients are going to be, and have also got your finances sorted, it is time for you to choose a business name and start basic branding. The company name and logo must be unique and must carry the potential to attract more clients. A good logo is instrumental in creating a good brand identity. Whenever people see it in advertisements, marketing materials, the products, services etc., they should be able to easily identify the brand. Naming your business and designing a logo can be very tricky and there is no right or wrong way to name a business or to design a logo for that matter. But you should always try and choose a name or logo design that is easy to recognize and recall. Apart from easy recalling, it should be clear and easy to read and pronounce. For instance, home2desing can be a confusing name, because if you see there is a numeric 2 in between ‘home’ and ‘design’. So every time you dictate this name to someone over the phone, you have to explain it’s not ‘to’ but numeric 2. The point to note is to avoid using numbers in your brand name. Similarly, you may name your company as EazyInterior, but again, the name is nice but the spelling is a little confusing and you have to explain that its z not s in your business name. Hope you get the idea, so you should always look for sweet, simple and easy to spell name which can be pronounced correctly. A few example of good business name for your interior designing business can be ‘Urbana Interior Solutions’, ‘ModSpace Design Studio’ or ‘Interior Sutram’ and so on. Hope you get the idea of choosing a nice and easy to recall and pronounce business name for your interior firm. And one more thing, avoid using too many colors, fonts etc because that may create issues when you use the logo for various printing and other works. Ideally there should be no more than 2 colors, font style. While designing the logo, keep in mind that it can be used in color or mono. As the logo designing is concerned, there is no harm in trying to design a logo on your own, but it’s always better to take professional help in branding. You can easily find and hire a professional branding agencies or a logo designer in your city. Alternatively, you may like to try some crowd sourcing platforms, where you can create a logo design project and get competitive bids for logo designing services from professional designers. They will come up with multiple variations or logo draft. You can take feedback and advise from your friends and family and choose one that meets your requirements. In order to formally start your business, the very first thing that you need is an entity or a company. Registering a company is not so difficult in today’s time. Most of the application process is online and there are consultants available as well who can help you register a company for a small fee. Usually it takes about a couple of weeks to get everything in place and start operation. As far as the type of company you want to register, there are 3-4 options. You may like to register it as a proprietorship or partnership firm, a private limited company or a limited liability partnership (LLP) or even a one man company and you can read about it all here on official website of MCA in detail. Ideally, you can go for a private limited firm or LLP, but there are lot of legal formalities and annual compliance. If you want to avoid it, then you can start as a proprietorship or partnership firm and then convert the company to a private limited entity, as you move forward. Once you decide which type of company you want to form, you have to pick three – four probable names. While submitting the form to register an interior design company in India, you have to mention a few names, because the first name that you want to keep for your company may not be available. They ask for a few names, because if the first name you have proposed is not available, they will check second or third and so on. Name search is the first step and this is to ensure that you get a unique business name. The best approach is to hire a practicing chartered accountant (CA) or a professional consultant to register a company. They know about the process and they can help you get through the process fast. Once you have registered the name, you have to apply for trade license (also known as shop and establishment license) from the local municipality. Once you have the trade license, you have to obtain a PAN number and then you can apply for a current account, and you are good to go into operation mode. You also need to obtain GSTIN (Goods and Service Tax), but you can obtain that after getting into operation mode. It hardly matters today, whether you are working from home or a luxurious office, especially when you are just starting up. Irrespective of whether you want to work from a rented office or a home office, you have to set-it up, so that you can work comfortably. There are a few basic office accessories that will be required like a desktop computer or a laptop, a printer, chairs, desks, internet connection, mobile and phone connection etc. Just remember, that in the early days of your business, you do not need your office to be too big and lavish. You can set-up a small office instead which must be well designed and well decorated because that is actually what your deal with. Keep some PC’s telephones, workstation and make yourself ready for the challenge. And you can always move into a big luxurious office as your business grows. But to begin with, you need to focus on the basics so that you and your team can work comfortably. Execution – execute everything as per the plan from carpentry to civil work and furnishing. Accounts –to manage day to account payable and receivable and filing tax etc. You can handle this on your own in early days and keep part time accountants for book keeping and tax filing. Obviously, to take care of designing part, you need a professional designer with expertise in designing 2D and 3D layouts. You need an execution team that will execute the project based on the design and specification. Then you have to have a sales and marketing team to send proposals, follow-ups, sales etc. You also need to have an accountant who will manage the financial part. You need a procurement manager and a site supervisor as well. Now, to being with, you can do quite a few of these tasks on your own and as your business grows, you can hire for these positions. Even if you can handle most of the tasks, you do need people who will help you in the planning and execution of the projects. So, you must build a small team and make them do the marketing, 3D tasks etc. This will form a part of your initial investment but it is needed. And, when your business will grow, you will automatically need more men and thus your core team can grow systematically. When you are starting out and building a team, always prefer to hire a team member who can handle multiple tasks. For instance if the surveyor who visits the site and takes the measurement is the same person, who do the site planning and designing, then things will be easy to manage and much effective. Apart from building the core team, you need various types of technicians and experts for plumbing, electrical, false ceiling, carpenters, guys for AC installation etc. Initially, you may not have to have them on all on your monthly payroll, instead you can sub contract these works to other reliable sub contractors. For example, you can hire a team for false ceiling, another team for electrical wiring and fitting, different team for flooring and so on. Having a good, functional website is seriously important in today’s time. There are many benefits of having a nice and functional website and lead generation being the important one. Your potential customers are going to search for interior designing companies online. Unless you have a website, you may not appear in search results and lose a potential customer. Your website has to be very organized and beautifully decorated because that forms the basic crux of interior designing. Again you can hire a professional website designing company and a copy writer to develop the contents. Process – you should explain the process of engagement like from survey to execution to delivery, you should explain everything. Testimonials –you can have video testimonials on this page. Having a nicely designed portfolio and good user friendly contents can be of great benefit to your business. So consider spending time, effort and some money and get a truly professional and mobile friendly website for your business. Apart from, setting up a professional website, you should also setup social media profile pages on some of the popular social media websites like Facebook, YouTube, LinkedIn, Twitter, Pinterest, instagram etc. The idea is to be where your targeted audiences are. You have progressed well and you are all set to start marketing and promotion. Now one of the biggest challenges for a business is to find the first few customers. It’s not easy to find a customer in early days of starting your interior designing business. But then, you have to overcome this challenge and that’s the only way to succeed and grow your business. Sales and marketing is a very tricky thing and you have to apply different types of strategies in sales and marketing. There is no one fit all strategy in sales and marketing and because what is working in Kolkata, may not work in Delhi because the targeted audience, their culture, approach etc are different in different cities. To begin with, since you have no client to work for, the best idea could be to start with your friends and family. Spread the word among your friends and family and if required offer them free design consulting. If they like your design, then maybe they will award you the execution responsibility. Offer competitive quotes to them and try to exceed their expectation. This way, you’ll be able to impress your customer and that in turn will help you with word of mouth marketing. They will become your brand ambassador and that will eventually lead to getting more customers. Second advantage that you’ll get here is that you will be able to build a real portfolio of your work, which you can show to the potential customers and get work. Most of the people, irrespective of age and gender are actively using social media platforms like facebook, YouTube, twitter, instagram etc. Social media can be a very powerful tool, and if done right, it can help you to spread the word about your services very quickly and in cost-effective way. You can use it to promote your services and get business leads. Use the platforms where you think your targeted audiences are spending their time and it could be facebook, twitter, linkedin and may be youtube etc. This will help you to reach more number of people, some of whom may actually become your future clients. The more number of followers or likes you garner, the more popular your interior business is going to become. Just make sure that you are a regular user of the social networking sites and post engaging contents and useful graphics. You can create some viral videos of your work and post it online so that it grabs the attention of more people. Using social media can be very tricky at times, so try and learn as much as you can about the popular social media platforms. There are tons of good quality contents available on how to promote business on social media site. In fact you can use the same very search phrase to find the good quality contents e.g. “How to promote business on Facebook” or ‘How to increase followers on Twitter’ and so on. Since you are in the designing business, more than anything else, you need to focus on visuals. Whether it’s your business profile or you are sending quotations to a particular business prospect, you should be very creative. We can’t ignore the visuals and if used correctly, visuals can do wonders in promoting your business. The whole thing of interior designing is nothing but a visual medium. It is about creating visuals in the means of home decorating, home furnishing products, space utilization and so on. If you are able to impress your clients with the amazing visual creatives, then your chances of winning the contract will improve dramatically. For example, if I have to evaluate three quotations from three different design studios. And the third company sends me a nice quotation, samples of some of his past works in the form of a case study covering first survey to 2D escalation and 3D designs and the final video of the work done. Which company do you think I am going to hire? Well obviously their quotation, rates, terms and time to completion etc is important for me, but if I go by what I have just seen, I will be biased towards the third company and probably hire them for my interior project. If you got a good understanding of photography, then you can click the pictures of your work on your own. But, if you are not a photographer, then you may hire a professional to get the pictures clicked. They will know the perfect angles that will bring more life and glamour to the pictures of the project. It is all about a part of the marketing of your interior design business and you must use it to your advantage. If you want to give your interior design business a perfect exposure to your market, then the trade events are a great platform for you. So, whenever, there is any trade event nearby, do not forget to register the presence of your startup. Besides, many industry experts attend those events and you can easily talk to them and get suggestions. You can also meet up reputed interior designers and make good connections with them as if they even tell a few good words about your work; it can easily fetch you big clients. And, do not forget to carry your business card in such events. You can give it to people whom you meet there. Just make sure that the card is impressive with proper contact details and website address mentioned in it. At the starting of your business, you may not always afford high expenditure on costly advertisements in newspapers or televisions. But, what you can do is to make flyers and distribute it. This is a much cheaper medium to reach out to the people. You can distribute these one leaf advertisement pieces in the crowded places or get newspaper insertion. To gain more attention, put a big impressive photo of your interior design business and some attractive content as a part of the design. If everything goes well and your destiny clicks, this is going to work well. Another way of building a strong customer base is through SMS and email marketing. Gather the email details of people who visit your company’s website and then start your own newsletter and ask people for free subscription by providing their email details. After that, send them mails by highlighting the major aspects of your interior designing business. Among those, many interested recipients will enquire about your business and may also ask for interior designing and decoration services. Make the emails very professional so that it makes the recipients to read and respond back. Since your website is new and you hardly have any fans and followers on social media, it’s going to be difficult to be difficult to bring visitors and potential customers to your website or social media pages. You should give them a reason to visit your website or to become your fan. So what can you to overcome this? Start an official blog and share all types of tips, articles, infographics and other well researched articles. You may like to talk about the latest trends, industry news, what hot in interior, how to choose color these and other tips. Writing and publishing regularly on your blog will help you attract new potential customers and also establish you as someone who knows interior bit. Well, you know that the field of interior designing is glamorous and so if you want to start your own interior design firm and make it a success, you got to be presentable. Usually the targeted customers will be well established business owners and a little up-class individuals and hence it is important to be presentable while meeting them. Wear nice decent clothes, be confident, reach on time for meeting, hear them out and respond politely. Moreover, people who are creative, have great designing skills generally have a good sense of personal styling as well, so I guess it will not be much of a problem for you. But make sure to be responsive and communicate clearly with your prospect and clients. Interior designing business has a lot of potential and if you are planning to start your own interior designing business, then this is the right time to get started. There are many budding entrepreneur who want to start interior designing business, but they don’t have any clue as to where to start. Today, we have discussed about some of the most important things worth knowing about starting an interior designing company in India. Right from how to choose a business name to how to get it incorporated and starting the operation, we have discussed about everything worth knowing. Once you have registered the business and you are ready to start the operation, Sales and marketing becomes important. Sales and marketing is certainly one of the most critical and challenging aspects of your business and so I have talked about various strategies that you can use to promote your business. You can use ServiceSutra to get connected with customers who are looking for experienced and professional interior contractors for interior designing of their homes and offices. We can connect you with the potential customers, but we have our own screening process and we only enlist companies who are registered and have prior experience. If you have all the documents in place and you are passionate about interior designing, then get in touch with us and we’ll be happy to connect with potential customers who are ready to hire interior contractors. And, at the end of the day, it is your talent that will speak. You only need to work a little harder in the initial days to form a good client base and once that happens, you will be able to scale your business, one client at a time. I wish you all the best in advance and firmly believe that with hard work, determination and talent, you will be able to make it big in the interior designing business in India. I have tried my best to explain everything the one should know to start interior designing business in India or abroad, but if you have any specific question, you can ask by commenting below. What else do you think one should know to start and grow an interior consulting business in India? Feel to share your views and comment. Finally, if you like this post then please helps us by sharing this post with your friends!